I’d like to say that I’m in full hermit mode, but I’m not quite there yet. I’ve been wanting to set up camp in the library for weeks, but there have been many obstacles. Fear of getting assaulted at gunpoint has me scurrying home earlier than I’d like to. My route to my car from the school is not exactly on the stretch where there have been a flurry of attacks, but I’m not exactly keen on taking chances when I am alone after dark. I’ll try to hit the books a wee bit tonight, but I don’t have high hopes for midnight oil success. I maxed out my (or any sane person’s) allotted caffeine intake earlier this evening, but didn’t exactly hit the high. I feel like I’m in perma-crash mode. Wheeeeeeeee. NOT. I had a girls’ night with my mother and my bestest friendest from high school. We hit the opera, a cheesetastic production of The Magic Flute, sung in English no less. Purists are cringing, I know. We got subscriptions together for this Opera Atelier season, which really just means we’re seeing all of their 2006/2007 productions…all two of them! The acoustics at the Elgin Theatre were awful. I am sure that I’ve seen a musical there before–perhaps Anne of Green Gables when it was here eons ago? (Random note: I’ve seen the production at the Confederation Centre in Charlottetown, PEI when I was supervising a group of Anne-crazed Japanese university students on a quick trip to the island of red soil. Best summer job ever.) Caroline and I agreed that our ears have been spoiled by the amazing sound at the new opera house. *shrug* Really, that is not something about which we are going to start complaining. Lemme see what else happened? Oh yes, my laptop proved to be, um, less than trusty. It now sits on the dining room buffet bottom side up, with gaping holes where battery and hard drive once lived. Okay, so the battery has been dead for a while (and reordered after warranty expiration, damn it!) but the motherboard was alive and well just a few weeks ago. Now? It is DEAD. Good and fried; but not finger lickin’ good, sadly. So if you are wondering why my commitment to Internet *cough* extracurriculars has been waning, wonder no more! I have appropriated my mother’s new laptop until school finishes, but I am going to use it to work work work till I finish my last set of freakin’ law school exams! Thank goodness I decided to be a cheapskate luddite and not register for the e-exam process. I will be handwriting all four of my 100% finals in a few weeks! Time to grow a few handy callouses. In addition to the opera, I also managed to drag myself out to the fantastic Reel Asian film fest. Superfriends, Helen and Phil scored me some free tix to the opening night at the historic Bloor Cinema. The film, After This Our Exile was by famous HK New Wave king, Patrick Tam (best known as mentor to Wong Kar Wai) and was his first in 17 years! I’ll admit that it wasn’t the world’s greatest film, but I did enjoy it immensely. As some of you know, I have an obsession with the Chinese diaspora and Tam’s treatment of a small slice of Cantonese-speaking Malaysia got me giddy. Honestly, I didn’t care when the movie took a wrong turn, I was too busy taking in the different Cantonese lilts. Even though I never travelled to a village like the one featured, I got the same high while sitting up on the Bloor balcony observing Tam’s Canto-speaking characters as I did when I discovered Cantonese enclaves in Penang and Kuala Lumpur. Chinese aunties in those faraway places knew just how to make feel at home! 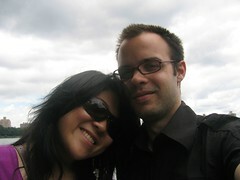 That night I got to briefly chat with my “date”, the lovely Andrea, who is back in the T-dot after getting her M.Sc. in something artsy fartsy in Ediburgh. As usual, she was looking fantastic, and made me feel like a lardy blob! I was all tarted up, but I looked like a slobby suburban marm next to that hapa beauty. Granted, Miss G had just been running around meeting with fashion folk all day. What’s a girl with a huge brain and legs up to her arm pits to do after getting a degree in something that ain’t “professional”? Work it. Woot. I’m actually excited about Andrea’s planned foray into modelling. Um, hello, I am an amateur photographer with a handy dandy DLSR and no real studio portrait experience. Can you say rental lights and pseudo-studio fun? I don’t think Andrea has yet agreed to let me photograph her, but I’m sure after I get the whole Internet to pressure her into it, I’ll be able to use her for her body. So come on, Internet, don’t fail me now! Just over 7 hours ago, I sobbed my way back to school along our country’s largest highway after kissing and hugging my one and only goodbye. Why all this yammering of weeks past instead of telling you about this loveliest of lovely American Thanksgiving weekends spent celebrating our love? I was afraid, my friends, that committing those memories to bloggy permanence would strain my heart too much. I am a lovesick wuss, dear friends. And I really wouldn’t have it any other way. These past few days have been truly perfect. Sure, we didn’t work as hard as we wanted to, but we sure did laugh a lot! And everyone knows that laughter is a great way to release stress. So increased stress from not working was quickly dissipated after giggle fits! I’m afraid, Dad, and everyone else, that I do not hide from my better half. In fact, I’m pretty certain that Dave would be interested in those crumbs too since they were chocolatey! Of course, Dave doesn’t like to get his hands dirty while eating, so I’d have to feed him the choco shavings. Hehehe. And as much as I loved that slice of comforting chocolate cake tonight, nothing can really mend this little hole in my heart. Nothing but Dave’s return to my arms in a few weeks. 7 hours since I said goodbye and 30 minutes till our 4th year anniversary. 4 years ago, on a cold and snowy night, I walked into Café Rencontré and met mon amour for the first time. He recalls it being love at first sight; and I felt a flood of feeling that certainly developed into true love fast. Coffee, a movie and then we were inseparable. Before I started law school in Toronto, Dave and I were together EVERY SINGLE DAY except for the days when I returned to Toronto to visit my family. 4 years ago, I found the keeper of my heart. In about half a year, we’ll be together once more. Forever. Happy anniversary, mon amour. Like you said, it feels like no time and forever. <3 My heart–it wants to burst–but I won’t let it; because it needs to be around to keep loving you. Je t’aime fort. This entry was posted on Monday, November 27th, 2006 at 8:44 pm	and is filed under The Sacred and Mundane, Academentia, Love, Emo-ed Out. we are also working on our 4th year, and it’s always so incredible to see the amount of memories we have piled up in some dusty shelf in our living room. good luck with your exams. i so recommend one of these stressy balls. The ones were you squeeze to stengthen hand muscles for your upcoming marathon writing session. Or else for distracting yourself so you don’t have to study. See, it’s so multi-faceted. get it! hahaha. Awww, I know 6 months seems a lifetime when you’re waiting to be with your lovey…I always had trouble with even just a few weeks when my D would travel for work. I hope the next half year flies by….it will be wonderful when you can be together for good! Big hugs to you and HAPPY ANNIVERSARY!! ha. you are too funny. all completely untrue, of course. we definitely need to meet up again soon! it was so very good to see you. though after all your craziness is over. good luck; you can do it! at least today was sunny, right? freezing cold, mind you, but sunny.